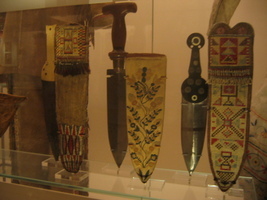 1 Caption: Knives and sleeves of the Indians Métis and Pied-noirs in the British Museum, London. 2 When you read about French explorers and trappers in North America, you soon read about the Métis. The word Métis means mixed. They were people who had intermarried with the First Nations. 3 They were not just mixed with French but also Scots and English. In fact, they considered themselves just people until Louis Riel tried to rally them all together at Red River. Since then, their strong cultural identity has had a name. For a time it was the third most common culture in the West. 4 Centuries before Columbus, there were stories of Celt and Viking explorers who came to North America and became part of the tribes. They were the original Métis. 5 When French trappers and coureur des bois pushed North and West, they also intermingled with the local tribes. The resulting culture was often a blend of the best from the French and First Nations. 6 One of the first things you might notice would be their clothes. Cloth was purchased from trading posts for shirts, blouses, and skirts. Deer or moose hide was used to make pants. These were often decorated with beautiful bead work. Many First Nations copied that art form from the Métis. 7 Coats were made from Hudson's Bay Company blankets. They didn't use buttons. Instead long sashes were wound around the waist to keep the coats closed. The sashes were also used as a rope when necessary. Whenever possible, their clothes were decorated with bright colours and beads. 8 Women were very conscious of their clothes. They often decorated their skirts with ribbons, and some wore brightly coloured sashes. Colourful shawls were worn on their heads and beaded moccasins on their feet. Children wore clothes like their parents. 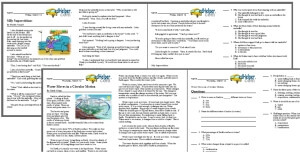 Feedback on Who Were the Métis?